Royal-Pedic is a 71-year-old luxury organic mattress company, renowned the world over for quality and comfort that lasts for generations. 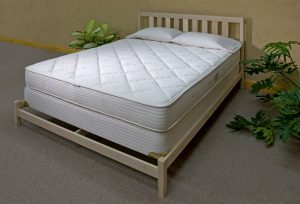 They have created a pair of firm inner-spring mattresses exclusive to The Organic Mattress Store. Both beds are hand-crafted in the United States, using only the finest organic materials—Certified Organic long-staple cotton, untreated French lamb’s wool, twice-tempered steel coils, and their patented Swiss-designed 630i boxspring system. These are combined to provide unsurpassed orthopedic support. Back Sleepers: A firm inner-spring with a sturdy coil-system and plush lumbar support is best for people who prefer sleeping on their back. Both of these Royal-Pedic inner-spring beds are engineered to offer the ultimate firm orthopedic support at shoulder, hip, and knee. Side Sleepers: Approximately 73% of people prefer sleeping on their sides. To maintain a straight spine and provide cushion at the knees, hips, and shoulders, add one of the exclusive natural latex & wool pillowtops. Front Sleepers: Firmer beds are better for stomach sleepers. Extra plush beds don’t provide enough support at the waist, causing excessive lower back strain. If you occasionally migrate to your side during the night, consider adding either the 2” or 3” Sunshine Hand-Tufted Wool Pillowtops for some added cushion. Do You Suffer from Wool Allergies? The Vegan Ease is for you! Royal-Pedic created this bed specifically for people with allergies, and those who want a bed completely free of added chemicals. Important Note: This bed requires a doctor’s or chiropractor’s prescription because it eliminates the French Wool Wrap, which acts a natural flame retardant as mandated by the 2007 Federal Fire Law 1633. It won’t matter whether you choose The Malibu or The Vegan Ease. With a Royal-Pedic organic cotton innerspring natural mattress, sold exclusively through The East Coast Organic Mattress Store, you can be certain you’re making the best choice for your health and the planet. Contact the showroom today to order your new bed! Your back will thank you.